The Dell Garage can supply and fit top brands of exhausts. We are able to recive the parts and fit within the same day for most vehicles. 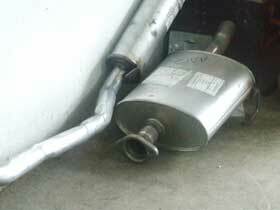 If your planning a long journey it is wise to check the condition of your exhaust. Listern for rattling, look for loose clips and black smoke when in use. Short journeys are worst for your exhaust because the exhaust does not heat up sufficiently to burn off water vapour from the engine. This leads to faster corrosion of the system. Although most corrosion comes from the inside of an exhaust, during the winter be sure to wash underneath the car to stop salt accumulating on the outside.